Adiscovered early on that the black jaguar spirit animal was my totem. In the shamanic tradition, spirit animals serve somewhat of a dual purpose. They can be considered spirit guides who appear in animal form, but they are also symbolic of energies that are working through you at any given moment. 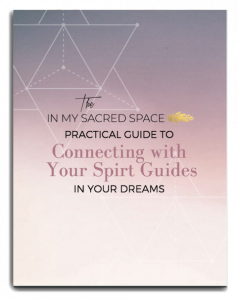 Spirit totems can come and go, as you work through various themes, and most of us have one who is with us for life, symbolizing an overarching life theme. For those who fall closer to the Wicca tradition, it would be considered a familiar. The first time I ever meditated, I met my spirit animal. He appeared to me as a black jaguar/panther. I guess that explains why my entire life, I always had a thing for black cats! When I was younger, I even considered getting a tattoo of a black panther and a moon, before I knew what a spirit animal was. There wasn’t really a logical reason for it, it was just something I felt drawn to. (Fun fact – black jaguars, black leopards, black cougars and black mountain lions are all “panthers” – it was once believed that they were a separate species and thus dubbed Panther, but later discovered that they were actually different species that came in black color). I later discovered that the moon is actually a very appropriate symbol to go with the black jaguar spirit animal, because in Mayan mythology, the black jaguar was seen as the ruler of the Underworld, and as such, a symbol of the night sun, lunar energy, and darkness. If we are to look at this symbolically, the black jaguar spirit animal represents the ability to embrace darkness, navigate it, and conquer your fears – of the dark, of death, of the unseen and unknown. Many people say that the black jaguar spirit animal represents the reclamation of power, and that makes sense, because living in fear IS giving your power away. In order to conquer fear, you have to be willing to take a good, hard look at the darkness within you. What are your greatest fears about yourself? Dive into them, understand them, and release them. When you do that, you take your power back. In that way, it’s about rebirth. You conquer the fears by going into them, traveling through the “underworld” and coming out on the other side (Black Jaguar spirit animal is also considered the lord of the underworld, like Hades). This is a symbolism that you will find in MANY mythologies, religious and occult teachings from around the world and throughout time. If you find yourself drawn to a particular animal, that most likely has some significance for you. What’s your spirit animal? Comment and tell me about it! I think my spirit animal is a wolf. What does that mean ? You can do a google search on the Wolf as a power animal and find all kinds of things. What it really boils down to is to study the characteristics of that animal that resonate with you (is it a lone wolf or a part of a pack? Grey wolf? White wolf? What makes it unique in the animal kingdom?) as well as where the wolf lives in mythology. I would assume that it’s a very prominent character in Native American mythology as well as probably Norse mythology and probably Greek/Roman mythology as well. Hey Dvora, I had the wolf as my spirit animal a few years ago. For me, it represented the ability to be part of a group (as a wife, a mother, a family), but still go ‘lone wolf’ when I needed to – whether that meant getting my own private space, or being able to relax, go on my Shamanic retreats, etc. I had dreams of this animal. The more I study about the jaguar, the I come to accept it as my power animal. When I was a kid, I would always see this animal almost everywhere. I even like the Jacksonville Jaguars in their first season. Them and the Carolina Panthers. I had a thing about tigers ever since I was a little child. I was so passionate about them that even though I was really young , I knew almost everything about these wild cats.Later on when I grew up I learned coincidently that I was born the year of the tiger. I occasionally dream about them, but there is one dream though that I’ll never forget of; My family and I were sitting indoors in our summer house when a big white tiger visited us. Everybody started panicking and screaming , but I was not afraid. Even though my family warned me to stay away , I got magnetized by the creature and went really close to it.At some point I started petting it.I felt like I was in heaven…So yeah, if there is such a thing as a spirit animal , it surely is the tiger for me! I have a couple of animals that have appeared in my dreams which were extremely memorable…The Cougar and The Whale. These have appeared to me since I’ve moved away from home. Both animals have been in my life since childhood, so it is difficult for me to decide which it could be. I’m leaning towards the cougar. It could be both. Who says it can be only one? I often have dreams that I am a black jaguar. In these dreams I am always protecting or saving people. Sometimes it’s people I know and other times I have no idea who they are. I am also not stuck in jaguar form, I can shift from human to jaguar on command. I believe it is my spirit animal but its strange how I am the jaguar and it is me. It is not a separate being it is me. What does this mean? I have even had dreams where I am someone’s spirit animal in my jaguar form. That doesn’t surprise me – your guides are aspects of you. They’re not separate from you (nothing is separate from you, really). It’s also possible that you are a guide for someone else and that’s what your dream is alluding to. I took this class with a Shaman in which I had to go into a meditation, find a tree ( to ground me, and make sure I could get back) in my yard that I love, and attach myself to it. From there I journeyed way to the inside of the earth..And it was very dark, there was a huge round room, but not really a room, a cave sort of, on the walls you could feel thousands of hand prints from others that had been there looking for their spirit animal or totem…You could hear animals running full speed round & round, all kinds..It was loud and scary, so I scooted, slided around the wall. When she told me I had to cross to a huge platform in the center, I thought no way can I make it with these running animals, they will kill me! But I made it., I just waited until I heard the huffs pass, and loud thuds, I climbed on the platform and stood up. I was instucted to call out for my spirit animal. After several minutes I had 2 animals one on each side of me. A lion & the largest wolf I had ever seen. ( It was still dark, so I cant esplain how I saw them so clearly, because I really couldnt) It was white with grey running thru, but mostly white. I thought for sure it was the lion, because I have a lion tattoo, but didnt know why, its just one I picked but a book of 200 pictures,but I gave it blue eyes, lol.My brother & myself have always collected wolf statues & pictures too.Shirts, Jackets, Blankets.So I was quite confused. She said be patient, wait. after 10, 15 minutes, the lion turned to me and said to my mind (” I have been with you your whole life, I have helped you over come much in your life. There are changes coming, but no longer fights,with self, or others, therefore, The wolf will better serve you now.” I cried & cried, and said thank you for your love and service, and he stepped down off the platform. I have told people the story before of how I got my totem, but not the whole story because it was so fresh, and I still cry when I remember it.. I met my power animal last August. In my meditation I went through several animals (deer, gopher, snake, goat, turkey) who all assured me they were not my power animal and encouraged me to keep looking until I finally found my power animal: the jaguar. He has helped me start the slow path to live a fear-free life. I’ve let fear take over and I’m constantly afraid but I know my jaguar will help me through this. I get very strong emotions just thinking about my power animal and realize I haven’t been meditating enough to constantly connect with him. Thanks for this post, it’s inspiring me to connect more to my power animal and regain control to conquer my fear. I was driving on a dirt road last night and saw a large black cat slowly walking on the side of the road coming towards me. I slammed on my brakes, did a you turn and followed it down a closed road that had a large pile of dirt in the middle. I shone my lights on it and it was not scared. It stopped and looked at me for a moment and slowly walked over the hill. I felt like he wanted me to get out of my car and follow. I really should have. His eyes were not reflective but a bright green color. I was trembling with excitement and had goosies all over. I had an overwhelming feeling to get out of my car but did not. I believe this would be my spirit animal. I have been told by two different phycics that my spirit animal is a cougar. But then last week I did a reiki share with a couple of ladies in the area and the one said that while doing reiki on me she was seeing a peacock and thought I should look it up. I know its possible to have many spirit animals but I am thinking that the cougar is my main spirit guide. I just went to a shaman and she told me my spirit animal is a black jaguar.. it is a beautiful animal and reading about them I see why i do some of the things I do. I can not wait to learn more on this animal.